Ash Maurya is the author of the international bestseller “Running Lean: How to Iterate from Plan A to a plan that works” and the creator of the business modeling tool “Lean Canvas”. His new book is "Scaling Lean: Master the Key Metrics for Startup Growth". Ash is also a leading business blogger and his posts and advice have been featured in Inc. Magazine, Forbes, and Fortune. He regularly hosts sold out workshops around the world and serves as a mentor to several accelerators including TechStars, MaRS, Capital Factory, and guest lecturers at several universities including MIT, Harvard, and UT Austin. ​Ash is currently the Founder/CEO of Leanstack.com, a company designed to provide world-class tools, content and coaching resources to help entrepreneurs succeed. 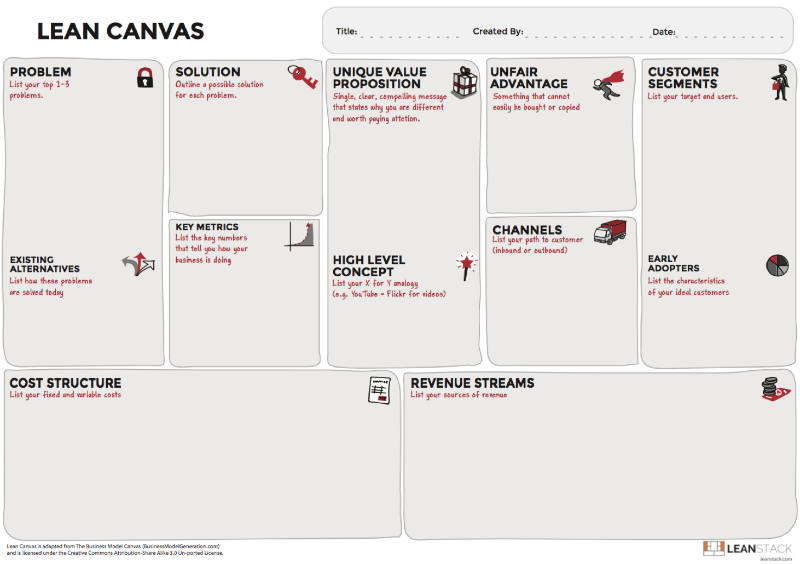 The Lean Canvas is adapted from Alex Osterwalder's Business Model Canvas and optimized for the Lean Startup methodology with a big emphasis on finding customer problems worth solving. For more details on the differences between Lean Canvas and the Business Model Canvas, see this comparison. Follow this link to begin building your own lean canvas.